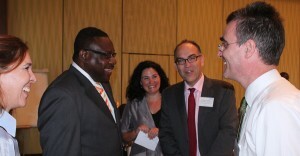 Minister of Social Care Steven Blackett (second left) shares a light moment with UN officials (from left) Lana Blackman; Christine Arab of UN Women; Stephen O’Malley of UNDP, Barbados and OECS, and Richard Blewitt of UNDP, Trinidad and Tobago. As regional ministers and social agencies gathered in Barbados this morning, Minister of Social Care, Steven Blackett acknowledged some of the barriers to women’s progress, noting that the Caribbean had to band together if change was to be seen. Addressing the two-day Caribbean Forum on Gender Equality and the Post 2015 Agenda on at the Hilton Barbados, the local minister told colleagues and other representatives from 13 Caribbean countries that in the lead up to the deadline on the Millennium Development Goals, gender inequality would continue to be an issue for women even though more of them now had access to education and work and enjoyed the opportunity to participate in elective government. “However, these successes continue to be undermined and threatened by challenges such as the incidences of violence against women and girls; the need to improve access to reproductive health care; and over representation of women in poverty in some of our countries. “Constraints on women’s socio-economic mobility due to cultural, legal and labour market barriers and women’s lack of decision-making power are all contributory factors which act as barriers to women being able to benefit fully from development interventions. There is therefore a need for a comprehensive approach if we are to meaningfully address the structural issues in relation to gender equality,” he said. Blackett relayed that poverty was a threat to a country’s development, and as such acknowledged the high levels of dependency which lead not only to lower per capita income and expenditure, but it also increased the burden of care which further curtailed participation in education and the labour market. He further reinforced the importance of the discussions that would take place over the next two days, noting that there should be focus on the implementation of strategies to address the issues of poor women which impacted their futures and that of their children and their countries. Women’s participation in the political, economic and social spheres he said, as well as their economic empowerment, was crucial to the achievement of gender equality, he said, and furthermore, participation by women increased their choices and voice in matters of family and the community. “It is therefore imperative that the post-2015 framework should include a specific goal on gender equality; should focus on setting targets to end all forms of violence against women and girls; should empower women to make the right choices; and should give women a voice in the decision making process.